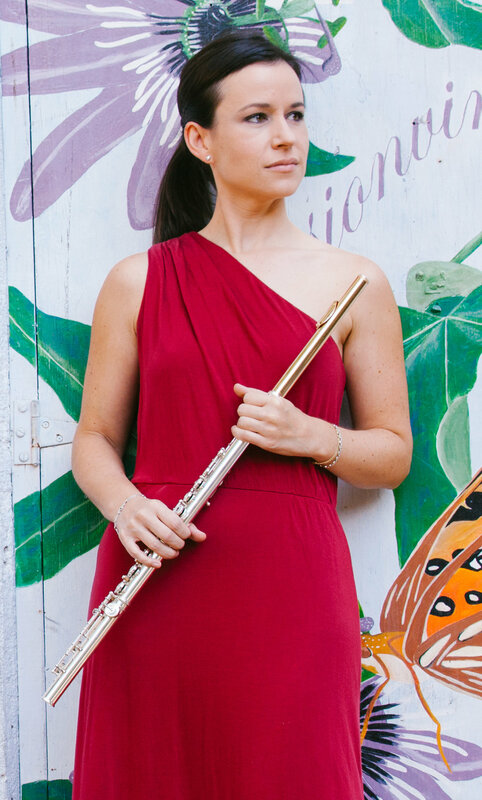 Praised for her vibrant sound and powerful musicality, flutist Alina Windell has captivated audiences throughout the United States and abroad. Dr. Windell teaches flute at Auburn University and since the summer of 2016, has been an Artist in Residence and faculty member of the Orfeo Music Festival in Vipiteno, Italy. In the summer of 2016, as a winner of the National Flute Association (NFA) Convention Performers Competition, she was invited to play in the Newly Published Music Concert at the NFA Convention in San Diego, CA; and played newly composed chamber music at the International Double Reed Society annual conference at Columbus State University in Columbus, GA. In 2015, she appeared as a featured soloist in a concert tour of Malaysia, sponsored by the Perak Society for the Performing Arts, and was a finalist in the Byron Hester Solo Flute competition in Houston, Texas. Recent or upcoming solo engagements include Auburn University, the University of Colorado at Boulder, Columbus State University, the Auburn University Jule Collins Smith Museum of Fine Art Concert Series, and Dr. Windell has performed at the Houston Flute Club Flute Fest and the Colorado Flute Association Flute Fair. Dr. Windell has performed regularly with professional orchestras, first as a member of the South Florida Symphony Orchestra and is currently a member of the LaGrange Symphony Orchestra, and regularly plays with the Columbus Symphony Orchestra. She has also performed at the Springer Opera House, with the Albany Symphony Orchestra, the Lynn Philharmonia, the Bloomington Camerata Orchestra, the National Orchestral Institute Festival Orchestra, the Opera Theatre and Music Festival Orchestra of Lucca in Italy, and in concerts at the Duxbury Music Festival, as well as freelancing in New York City. An avid chamber musician and advocate of new music, she recorded the music of Carter Pann for the Naxos record label, premiered Circles by Rachel Matthews at the Pendulum Concert Series at the University of Colorado at Boulder, and performed for two years as a member of the Chinook Winds, the graduate wind quintet in residence at the University of Colorado in Boulder. Dr. Windell has recently formed the Duo Flautas Frescas with Dr. Julia Barnett, to discover, commission, and perform music for two flutes and piano. Duo Flautas Frescas’ first commission is from composer and flutist Valerie Coleman, to be premiered at the 2018 National Flute Association Convention in Orlando, FL. Recent or upcoming masterclass engagements include the University of Alabama, the University of Alabama Birmingham, the University of Nebraska in Omaha, Columbus State University, Sunway University in Kuala Lumpur, and the Kinta Valley Wind Ensemble in Ipoh, Malaysia. Dr. Windell’s flute students have received honors which include entrance and scholarship to the Interlochen Arts Academy, first chair in the Alabama All-State Band in Mobile, AL, and have been prizewinners in competitions including MTNA, the Atlanta Flute Club, and the Alabama All-State Band Solo Festival Competition. She completed her undergraduate studies at Indiana University, her masters with renowned flutist and pedagogue Carol Wincenc at Stony Brook University, and doctoral degree from the University of Colorado at Boulder, studying with Christina Jennings. She teaches flute and music appreciation at Auburn University and maintains a private studio.